Aquila Table Football early 1970s. “After Waddingtons bought out Subbuteo in 1968, inventor Peter Adolph was retained as a director and consultant. However, Adolph felt he was not being listened to, and the relationship was short-lived. This resulted in him resigning from the company in 1970, and as if to prove a point, he immediately set about designing what he hoped would be a superior table football game. Aquila was the Latin name for an eagle, and Adolph had already used it for a subsidiary company in Barcelona (who would also work on the game). The story is told delightfully by Peter Adolph’s son, Mark, in his book Growing Up With Subbuteo. Mark, who was around fourteen years old at the time, was delighted to be helping his Dad out with a new game. Most of the set does appear to be a copy of Subbuteo, and the rules show the figures being flicked in an identical way. Mark mentions that the new figures were in an “up-to-date” style with 1970s haircuts, but that his Dad also wanted to produce “vintage” figures in baggy shorts to recreate famous matches. 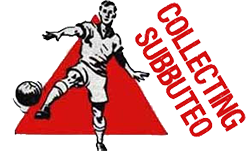 The key difference with Subbuteo was the use of a larger 2 inch striker figure for set pieces, a concept suggested by Mark. These were mounted on a spring, and set into a heavy lead base (for stability). The idea was that you could rebound aerial balls off this figure for impressive realistic goal mouth action. The figures were manufactured in three different poses – two jumping to head the ball (arms up, and arms down), and a player in mid volley. Mark mentions that “thousands” of these figures were duly produced, and that he spent much of his holidays and lunch times painting the things. He liked the fact that the different figures produced an array of different random deflections. A box illustration was commissioned, and prototypes assembled. Apparently around twelve prototype sets were produced in all, plus extra team squads and strikers. A set of Aquila table football in excellent condition can worth up to 1000 pounds! Ci occupiamo ora di un set datato 1973. Si tratta del set Aquila table football, realizzato ma mai andato in commercio. Si crede che circa 12 esemplari siano rimasti in circolazione. Un set in condizioni eccellenti per un collezionista potrebbe valere fino a 1000 euro ! In basso alcune immagini della confezione. Per la descrizione riprendiamo il contenuto dal sito di P.Upton.